In 1923, President Calvin Coolidge walked from the White House to the Ellipse to light a 48-foot fir tree decorated with 2,500 electric bulbs in red, white and green, as a local choir and a “quartet” from the U.S. Marine Band performed. 95 years later, this American holiday tradition continues to bring citizens together to share in a message of hope and peace. 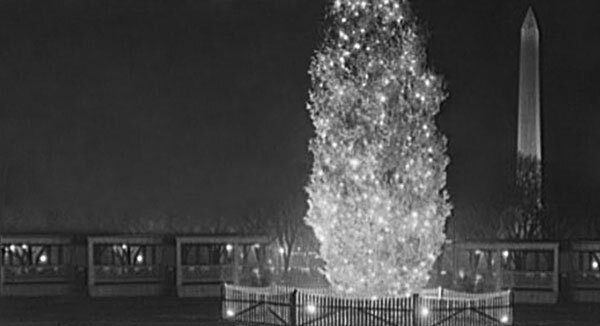 The history of the Lighting of the National Christmas Tree is intertwined with the history of America. Through peace and war, from national celebration to national mourning, Americans have gathered together and celebrated the season in this holiday event. 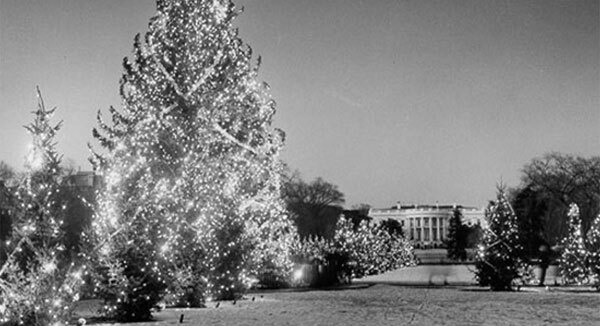 In November, First Lady Grace Coolidge gave permission for the District of Columbia Public Schools to erect a Christmas tree on the Ellipse south of the White House. 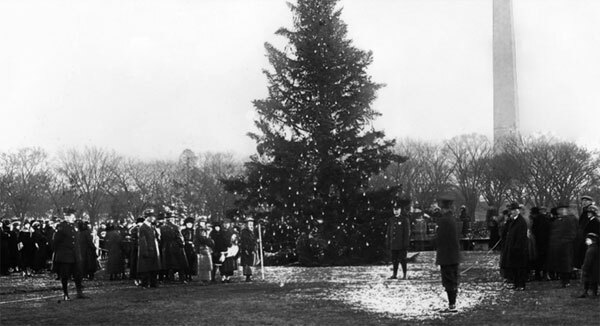 The organizers named the tree the “National Christmas Tree.” That Christmas Eve, President Calvin Coolidge walked from the White House to the Ellipse and “pushed the button” to light the 48-foot Balsam fir, as enthusiastic spectators looked on. President Franklin D. Roosevelt never missed the opportunity to deliver a Christmas Eve message heard by radio listeners coast to coast. 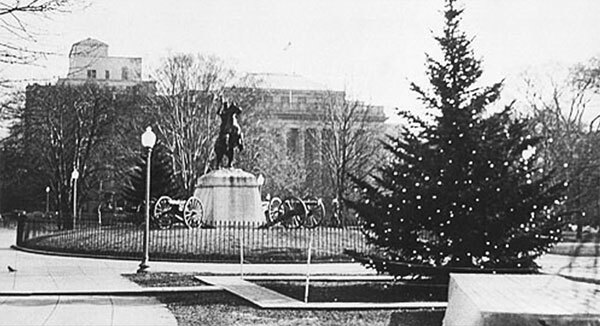 In Lafayette Park, north of the White House, two Frasier fir trees were planted on the east and west sides of the Jackson Statue in hopes that they would be used as the National Christmas Tree in alternate years. The 23-foot fir west of the Jackson Statue was used this year. A year before United States entered World War II, President Franklin D. Roosevelt condemned war, invoked the beatitudes of Christ, and called on “belligerent nations to read the Sermon on the Mount.” At the ceremony, he also prefaced his prepared remarks with an announcement that he and Mrs. Roosevelt would like the celebration moved to the South Lawn of the White House grounds next year. He remarked that such a shift in locale would make for a “more homey” celebration. 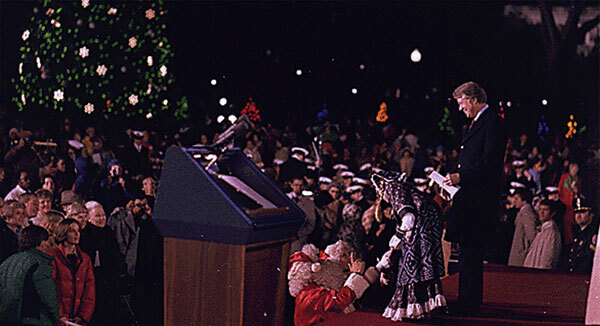 President Truman lit the tree, which had not been lit since 1941, and delivered a Christmas message. Standing on the bandstand on the South Lawn, he said, “This is the Christmas that a war-weary world has prayed for through long and awful years. With peace come joy and gladness. 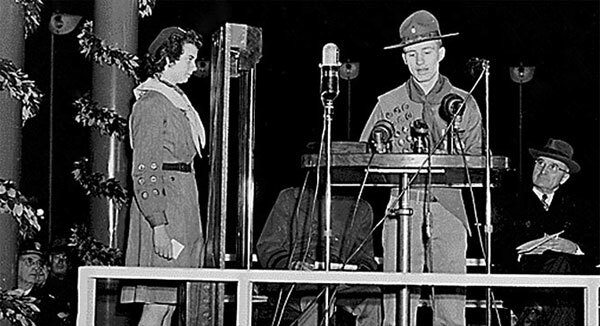 The gloom of the war years fades as once more we light the National Community Christmas Tree.” Members of the Boy Scouts and Girl Scouts spoke at the lighting ceremony. Earl C. Hargrove Jr., with his good friend Bill Law, began decorating the National Christmas Tree this year, and Hargrove, Inc. — Earl’s company — has continued that tradition to the present day. 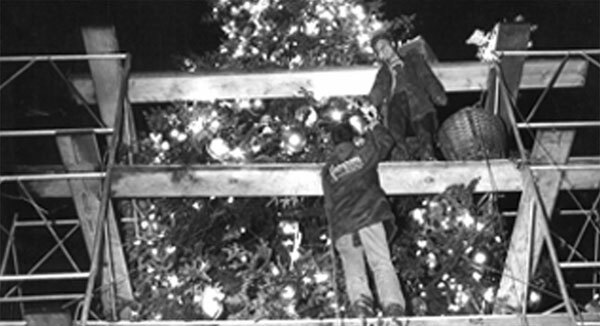 The two men trucked in a 60-foot tree and had to secure it in a custom stand. The National Park Service erected several stories of staging to help them. Unfortunately for Hargrove, there was no such thing as a “string” of lights. He manually installed sockets every foot on several hundred feet of wire and screwed in and tested every bulb. When bulbs became a finicky, Hargrove would climb up and fix them in a Santa costume! In 1954 the Washington Board of Trade and the Washington Citizen’s Committee conceived of a wider celebration called the “Christmas Pageant of Peace” in which the tree lighting event expanded to three weeks. A “Pathway of Peace” was composed of smaller trees representing all the states, territories and the District of Columbia. The 1954 opening ceremony was held December 17, when President Dwight D. Eisenhower turned the switch. The longer event, with local nightly entertainment, proved very popular and continues to the present. 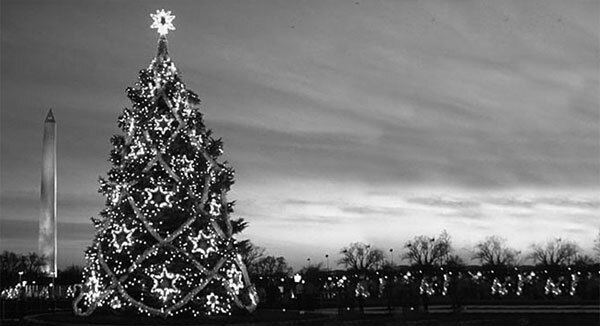 Shown here, the 67-foot Engelmann spruce from New Mexico placed on the Ellipse in preparation for the second annual “Christmas Pageant of Peace” in 1956. After the death of President Kennedy on November 22, the lighting ceremony was postponed until the thirty-day period of national mourning had passed. On December 22, President Lyndon Johnson, accompanied by First Lady Lady Bird Johnson and daughter Luci, opened the lighting ceremony saying, “Today we come to the end of a season of great national sorrow, and to the beginning of the season of great, eternal joy. 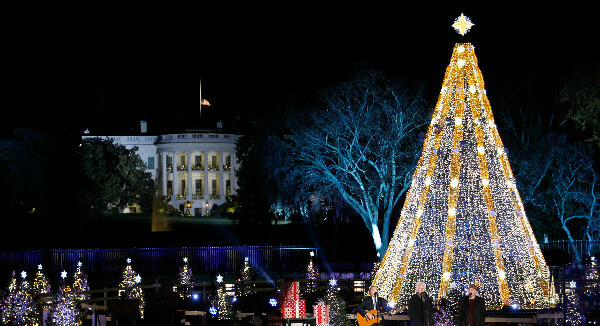 He shared his hope that the nation would “not lose the closeness and the sense of sharing and the spirit of mercy and compassion, which these last few days have brought to us all.” General Electric designs the lighting and decorations for the National Christmas Tree for the first time. 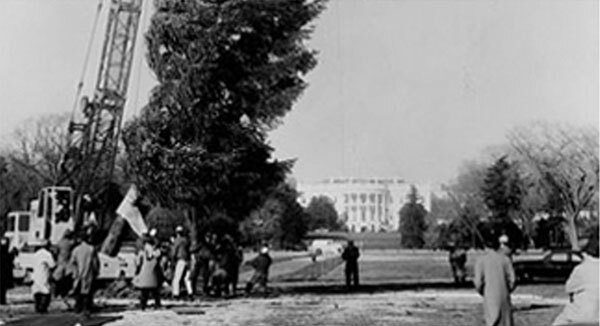 After the death of two previous live trees planted on the Ellipse, National Park Service horticulturalists searched for a new National Christmas Tree that would be healthy and strong enough to survive a move to the Ellipse. They found a Colorado blue spruce in York, Pennsylvania at the home of Mr. and Mrs. William E. Myers. When the tree was six years old it had been planted in the Myers’ front yard as a Mother’s Day gift. The tree was 15 years old and 30 feet tall when it arrived in our Nation’s capital 30 years ago. President Jimmy Carter and his daughter Amy were the first to light this special tree. President George W. Bush and First Lady Laura Bush, with the assistance of two area Washington, DC schoolchildren, seven year olds Samara Banks and Benjamin Schneiller lit the tree. Samara and Benjamin participated in the President’s “Call to Service” program by volunteering their time to prepare and distribute food for homeless men and women in the Washington, DC area. 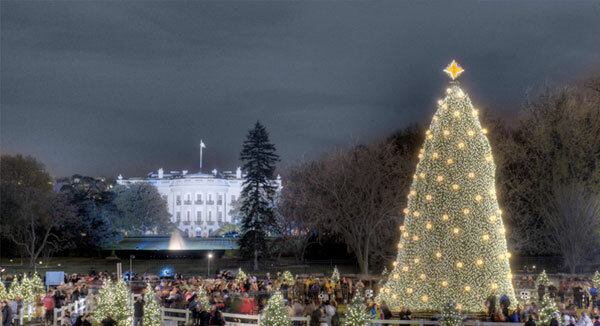 LED Christmas lights were used on the National Christmas Tree at the request of the White House GE thus made the National Christmas Tree more energy-efficient than ever before. 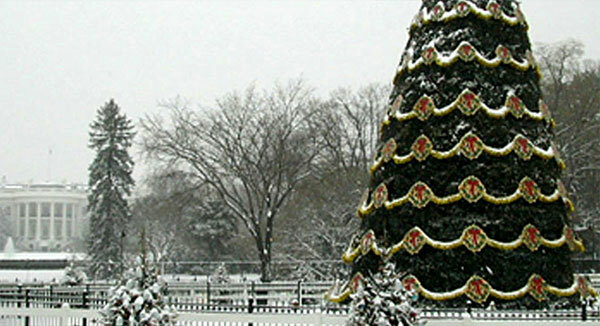 GE has been designing the National Christmas Tree since 1963, producing and donating the lighting and decorations. Powered almost entirely by light-emitting computer chips called LEDs, the 2008 National Christmas Tree display was 50 percent more energy efficient than the 2007 display. This is also the first time Santa’s Workshop was found along the Christmas Pathway of Peace, sharing holiday cheer and safety tips with all families this December. 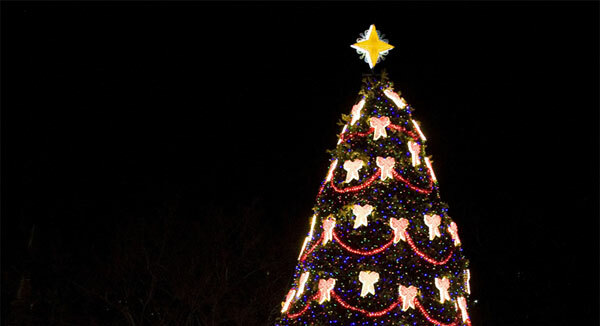 Helping kick off the National Park Service Centennial in 2016, the theme of the 2015 National Christmas Tree paid ode to this momentous occasion, trimmed with sparkling gold ribbon and silvery white stars and lights, colors and trappings that are traditionally used for milestone celebrations. The Lighting Ceremony itself interwove the Centennial theme. Everyone that took to the stage that evening – from President Obama to musical talent – had the opportunity to shine a spotlight on their personal connection to national parks.